Today all eyes are on Toyota's reaction. The aggressive move made by Nissan with respect to the reduction on prices of some of its models, is starting to worry to the other automakers, especially when they are putting at risk the progress that the industry has been showing after the difficult economic recession that occurred in the country some years ago. The cut in prices by the Japanese automaker has represented an increase in sales in the United States. For example, in the past month, the increment was about 25%, about three times more than the average growth of other brands in the industry. The biggest concern is that, it is very likely that the three largest in the United States: General Motors (GM), Chrysler and Ford, follow the steps of Nissan since things have not been very well for them lately. Today all eyes are on Toyota, a brand that has always dictated the next step as far as prices are concerned. Usually, Ford and GM have followed far behind the pricing strategy of Toyota, while Nissan has been characterized by carrying out some erratic pricing plans. The Nissan price cuts have meant that consumers pay an average of $500 less for their vehicles. The case of the Rogue model is something special because the original price has been reduced by up to 12%. It means that, if you paid a couple months ago for the new Nissan Rogue 2013 an amount of $22,747, today you only pay for this crossover a cheaper price of $20,310, a price cut that would put on alert to any contender. 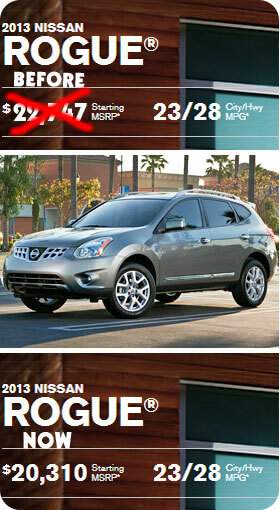 These pictures are just a small proof of how affordable are the new cars of Nissan at this moment in North America. If Nissan has dropped the price of the Rogue, it is because that SUV is a cheap copy of the wonderful Murano, that's why I think, I see the Rogue discontinued for next year. I agree with you bro, it looks like a big wagon or something like that, but the Rogue definitely doesn't look like a real SUV, too basic and simple. I like the Nissan Rogue, I think it is an SUV built for women not for men, If I could afford it, I'd buy it.